Roger Federer's Shanghai campaign got off to an almost hiccup free start as he defeated Andreas Seppi 6-4 6-3 to move into the third round where he'll meat Gael Monfils. It was Roger's first competitive match since his loss to Robredo at the US Open so it was difficult to know what to expect from him or where his game was at. As it turned out it was pretty much what I thought would be the case – confidence still low but movement and overall game much much better. Seppi is a tricky guy to face early in a tournament (3 career titles, career high ranking 18) so it was obvious Roger had to play reasonably well to get the win and fortunately he managed to take his chances when it mattered. Not quite vintage but I think there were some positives to take from this and there were a couple of things that happened in the match that should give him confidence which I'll cover shortly. The match actually started well for Roger, holding to 15 but after Seppi held his first service game he then broke the Federer serve despite the Swiss hitting an immense volley at 15-40 to stave off the first break point only to double fault on the very next. Disappointing. I realised during the match that saving a break point with an immense shot only to play the next one poorly has been a recurring theme this last year or so, today it happened when he got broken. And we also saw it on the 2 match points Stakhovsky had at Wimbledon (laser guided pass followed by timid backhand), the set point against Tsonga at the French where he hit the backhand flick to save 1 break point, the tie break vs. Berdych at the USO in 2012 where he hit a full stretch volley, the World Tour Finals tie break vs. Djokovic after he hit the whipped passing shot from behind him. The list is endless and they all followed the same pattern, the first big point is played like a GOAT but the next big point he wilts and loses. Strange really, almost like he's drained and not ready for the next one so quickly. Anyway despite dropping serve he was able to respond quickly taking his first break point chance at 15-40 with a brilliant smash to level at 3-3. Of course he found himself in more trouble in the next service game but saved 2 break points before holding. Again at 4-4 Federer slipped down love 30 but found 2 back to back aces to move into a 5-4 lead. He was then able to take advantage of a Seppi double fault at 15-15 before breaking to take the set 6-4. The rally at 15-40 was a great mental victory for Federer here too as it showed his excellent defensive and offensive abilities. He had Seppi to thank for giving him an opportunity to take the first set but winning it was all his own doing which definitely helped his confidence. The first set was always going to be key and winning it both helped Roger's mindset and clearly frustrated Seppi who had plenty of chances. This showed when Roger got the key break at 1-0 in the 2nd with more adept net play. Again he had to come from behind to consolidate but did so convincingly winning a key rally at 15-30 to move into a 3-0 lead. By this point Roger was finally getting into the groove where he is able to play without thinking too much which of course brings out his best and he got himself in a position to serve for it at 5-3. There were always going to be question marks over whether he could serve it out without being too shaky and it didn't look great at 0-30 but he then found a 2nd serve ace and another ace to make 30-30 before finally sealing it on his second match point to take it 6-4 6-3. Not the cleanest match from the stats, but Roger actually hit 17 unforced errors in the first set so was able to clean up his act in the second set. Stats don't matter though here, the win was the key thing and he was able to get it. Overall I'm very happy with this win, I said prior to the match I was looking for 2 things – movement and confidence; and I thought he delivered on both those things. He moved very well throughout the match which clearly helped him hustle some important points which has to be done against a quality opponent like Seppi. 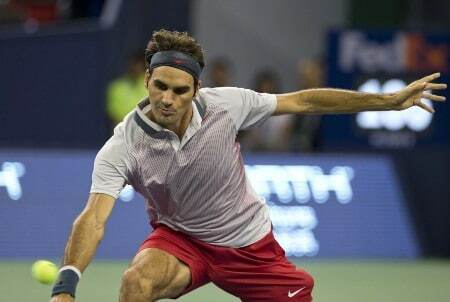 The way he moves to his forehand side is always an indicator of fitness and I thought he looked pretty sharp. I don't think the footwork is quite there just yet but it's not too big a concern, there were a couple of times he got his legs in a tangle but was able to recover quickly and maintain his balance which is probably testament to the work he's put in since the US Open loss. As for confidence it's definitely still lacking as we saw when he got broken in the first set but 2 things happened that will definitely be a boost; the first is that he was pretty clinical with his own break point chances and the second that he served the match out first time of asking. I was praying that he had to serve to win the second set / match as breaking serve like he did in the first just wouldn't have been the same for him. He needed that feeling of closing it out himself which I think will have helped him. No doubt some fans were expecting Roger to crush Seppi due to the 9-0 H2H but I think anyone near the Top 50 would have been a tricky opponent today, it's not easy coming back from a ridiculous loss at the US Open, playing in front of an expectant crowd and with Nadal watching all adds to the pressure which he handled well. It was a big maybe shall I say 20 minutes going up a set and a break, really started to feel comfortable. Even though it remained tough, Seppi did a good job of hanging around. That's the kind of first round match you want in this particular situation I'm in right now. Next up for Roger is one of the biggest entertainers on tour Gael Monfils who beat Richard Gasquet's conqueror Vasek Pospisil. Roger leads the H2H 6-1 so on paper this should be an easy match but with Monfils you just never know. He is inconsistent, his game goes on and off like a light switch but when at his best he's very dangerous. The one thing Roger has to be wary of is Monfils's court coverage as he's very difficult to hit through so it will take some nice controlled aggression from Roger to see this one out. I think coming into the net will be a profitable tactic and he looked to execute that today against Seppi to there's no reason why he won't vs Monfils. I see Roger getting it done in straights, the match today should surely have boosted his confidence and I don't see Monfils as the type of opponent Roger will doubt himself against too much. I think they both respect each other too based on their reactions at the net in previous matches and Roger usually plays very well against players he genuinely likes on tour for some reason. I'll go for 6-4 6-4. It could go 3 but I think Fed will improve on today's performance. Damn it Alex 🙂 but my first runner up though! Yeah you gotta build on this now! I must say the first set was on a very low level from Rogers side, and he was lucky Seppi was not at his best, because then he would have taken it. Roger looked very rusty and his shot selection was just of the radar and he looked in doubt of what to do many times. It got better in the second set for sure, but I was exspecting more to be honest. and the match stats was not great even though he picked it up in the second, way more unforced errors than winners and only 9 of 19 at the net?! Which I wasen´t happy to see because this has been a problem most of the season for him, coming to the net at on weak aproaches and to much serve and volleying on the second serve. I understand he needs to make the rallies short but not by any means and with the racquet and string technology these days coming to net needs to be on the right times. So I guess tomorrow against Monfils, who´s finding his groove again, we will see the level he´s really at right now. Actually, Mark, I’m not sure if you remember the post I made where I mentioned that the sweet spot zones on the Pro Staff 90 are slightly larger than the Pro Staff 95. I was surprised when I learned that. Perhaps Roger has been tinkering with other aspects of the frame, like weight, balance etc. And, his Pro Staff 90 is really heavy with very low tension too, which gives him that oomph. So, how is he going to get to where he wants to be? I have no idea. We will see. Sid I guess that had slipped my mind because I to was surprised when I read your post back then. But maybe it is because I was really looking foreward to see Roger playing Shanghai with a new determined mind set and a new sword to do his magic with. But yes maybe it is a new 90 with some new technology. But isen´t it strange we haven´t heard anything about it yet? The media must be curiuos about it to. Well seems like I finally made it 😀 Hope Fed wins his second of the season in Shanghai!! I just replied to your comment on the other post but if you’re ever having trouble with live chat let me know via contact form and I’ll try help. Hopefully he can dispatch Monfils fairly routinely. Replied on the other post also. Anyway I think it must come from the internet connexion at work. I am glad I could at least see live scores! Very petulant Conal lol almost Murray like. Monfils will be a tough matchup I reckon, could easily go in 3. Needs to get the first serve accuracy higher. In terms of aces in this match, he did pretty well, serving two in a row twice at 0-30 occasions. Yeah Monfils has good court coverage so cheap points will be a must. I think much depends on which Monfils turns up, if he plays passively then I can see Fed being able to dictate too easily and control points. If Clownfils hits his FH with power then he can cause problems. Picking Fed though cos I wanna see how he faces up with Djoker. I want to see Fed play Djokovic as well, but still a little concerneed for him for his points in the race rankings. Thanks to his poor ranking, he’s getting Nadal or Djokovic in quarters nearly all the time this year. Well I think it’s realistic Conal that Roger ends the year as 5. I think Murray finishes the year as 4 now that he’s not playing again for the rest of the year, don’t know if he’s playing Brisbane either. I think Roger gets Rafa/Novak in the quarters at the Aus Open next year. Wrapped it up nicely there Jonathan. Missed the match last night and caught up this morning. 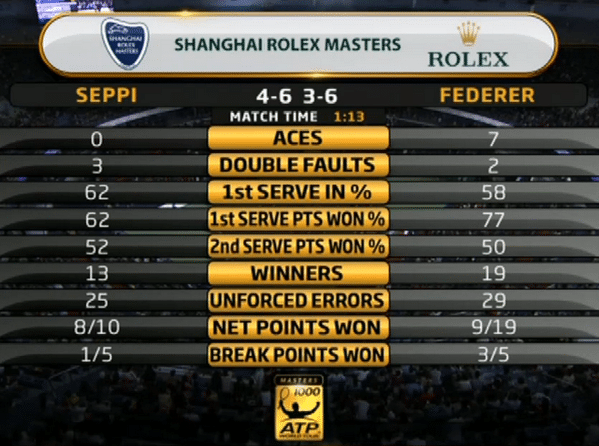 The first set, Fed was reeling. But it was expected, the guy hadn’t played since Robredo so I’m really happy with the match. I’d have to disagree with the point you’ve chosen though, I’d say easily the running forehand and then the angle forehand that followed at 3-1 in the second set but it was important Roger was coming out of the winner’s end when it came to rallies. Seppi really should’ve won the first set but I’m not complaining. This match is just what Roger needed I think, I really liked his attitude on the court today, he was fist pumping at pretty much every winner he played. He rushed at the end when he was serving for it but no doubt got the serve when he needed it and that should help him later in the tournament. Honestly, I think right now it’s just important for Roger to get match practice and win the points under pressure. That’s the only way he’s going to get confidence. If he gets past Monfils (looks to be a fun match) I don’t know if he’ll be ready to take on Novak. I just hope he can get out of pressure free moments for now and maintain some momentum for Basel (where I think Nadal will be a no show). Speaking of Nadal, I cannot believe his idiotic comments about Troicki, he’s saying it’s ok to miss a test and just take it the next day? Are you kidding me, that defines the whole purpose. Djokovic as well. And these guys are the ambassadors of the game. At least Roger is still there to put some sense into this whole debacle. i think Monfils will go to 3, either way, some entertaining tennis will be played. Allez. I forget the point to lead 3-1, will watch highlights when I have chance. First set was key I think though, took his chances so I picked that point reminded me of Fed close to his best. Disagree about Troicki though, I think Djoker is right to defend him. Seems to me like the guy has been hung out to dry here and made an example of. Very easy pickings for the ITF / ATP, they know he’s no real loss to the game, any hint of wrong doing and they can use him as an example of how strict they are on doping thus deflecting attention off the game as a whole. If Federer, Dull or Murray had done this, which I believe is failed to give a blood sample because they were ill, apparently been told that is ok and then given one the next day which tested negative then I highly doubt they would be banned. Yes Jonathan, Troicki has been made of as an example for it’s non existent strict codes in place. I totally agree if a top player had been in the situation they would’ve gotten away with it. I’m unaware of a time that any of them have done that so I can’t say. But I don’t agree with the notion that it’s ok to just do the test the next day just because you are “ill.” Roger was right. There should be no circumstances where a player skips a blood test unless it’s extreme. I understand, that tennis revolves around money and that top players are protected in this system but there’s ALOT of miscommunication and he said she said here. Once again, nothing is made clear in the protocol. We don’t know if the doping officer allowed Troicki to miss the test and have for him to do it the next day or if it’s just one big lie as you said maybe to set an example (a poor one might I add). If he was given permission to do it the next day, that’s a problem. Why is he being given permission to do it the next day, just because he was “ill”? nonsense. I don’t believe a doping officer would allow a player like Troicki do it the next day. That’s what the issue is. So much inequality and money involved in tennis, you never get the truth. Hey, just watched highlights! Thought Fed looked pretty lively, despite the ufe count. Lateral movement def better, losing a few kilos has helped there. Liked that he was looking for the ball so much, taking it on. Desperate for him to come thru to meet Novak so we can assess his end yr prospects better. Ref London, Muzza bring out will loosen the pressure a bit and Gasquet losing. I tend to side with Rafa here( can’t believe I just said that) that roger will qualify and make it with relative ease to the O2. And Rafa supporting Roger today, applauding etc. is the bromance reignited?? Reckon Sid will hv something to say about that! I don’t know what you guys think but I wasn’t impressed at all with Roger today. But, it didn’t seem like he found his range in the second set. With this form, he will get rolled over by Djokovic. The next game should give him an opportunity to improve. Thanks Jonathan for the analysis. Closing out a match is something I really look for so was happy to see Fed do that. I felt his net play % could be better, he missed a few normal ones but at least he is coming forward and after the 1st match will probably do better. In the long run he did what he needed to do when he needed to do it. That kept the match to 2 sets (yeah). I think the two sets thing is important also. What was Nadal, Fognini, Marc Lopez and Haas doing there? An odd group. The match with Monfils should be entertaining, the guy is a tricky opponent, literally 😛 But hopefully he raises his level, then we shall know how he will fare against Djokovic. Is Roger is playing both singles and doubles tomorrow? By the way, didn’t Granollers get a restraining order for Djokovic? Or maybe he is a sucker for bagels. Either way, one less doper to deal with at Shanghai. Did anyone thing that Zhang guy was absolutely awesome at the net? And also solid and smart returning? Their opponents may not have been quality but isn’t Zhang number 4,389 in the world? Zhang and Federer as a doubles team could be even better than Federer and Wawrinka! hi all –for me the key thing to look for in this match was Fed’s ability to win long rallies and points. in the past siz months, he’s been doing all that Jonathan noted (not following up on great points etc.) but also inevitably losing any long rallies that go beyond 15 shots. it’s almost as if players know that federer the shank-dude will appear if they hang around in a point too much. what is great about these fast courts is that the points are shorter and even the rallies reward aggression. fed won the longest point in the match on an unforced error from seppi. the point itself did not involve any GOAT antics, but what i liked was that he played sensibly, safely and with high percentage. i feel as if he needs to do that with monfils as well to win the match and get ready for the inevitable beatdown by nole. sigh. who knows, mebbe monfils will break dance instead of hitting balls, and nole will just cower at fed’s cooler outfit! Ok, so Tommy “Haas” chickened out. Does this mean Roger gets on court right away? I was already really into Maiden mania , I was listening to Powerlsave and the Number of the beast cassettes 10 times a day each . But how do you call it ? Compromise . God Steve Harris forgave me for that I believe . In 1988 I didn’t even know what music was. It seems that this is becoming a perfect first commenter blog especially now that Fed s not doing so well. Its getting pretty annoying and I think you should stop that . Saturday morning I checked with my mobile phone : lousy 3g connection , heavy blog page opened after a minute and it was there for me . A brand new Jonathans post with no comments. Than the bell rang my kids rushed out of their english class and POP the dream was gone. Off course a couple of minutes later all you blood thirsty sharks had moved in. Or at least you should have a 40+ category of competing just like the club tennis tournaments. To the match now , yes I agree you said everything and that’s one of the reasons this first commenting comedy is getting so big. I had the chance to watch the whole match and when I saw Seppi break I was very upset thinking we ll have to go through all this sh*t we ve been through lately once again and even worse. Thankfully Seppi was not in a killer mood after that gave the chance to a more focuses Fed to bounce back. I think altogether the whole thing is positive. I also believe Fed s going to get through Monfils in two and I also have a feeling that something good is going to come out of the quarterfinals. Off course nothing less than a win will be good enough. I think that Fed will go in for the kill while Jokovic has a bit of this mixture of overespect/fear for Fed and that will do it! Hopefully. P.S. Please could anyone of you check with this stupid online ticket booking system of axs for the Tour Finals? It doesn’t seem to work as it says there are no tickets , even for the morning sessions for the first days. I wrote to them twice and I got no response. I’d use Ticketmaster? Is that where you are trying to get them from? I saw the highlights yesterday evening. Overall, I can rate his game 6/10. Roger had struggled on his serve most of the time, but when he needed big server, he delivered! Which is a good sign and this was something he lacked during the course of 2013 matches. 2 points from yet another miserable defeat against Monfils, heavens above. Just managed to pulled set of the bag, 7-5 in tiebreaker. Deciding set to come, 0-1 on serve. Just checked the score. Wtf happened, Fed out in Shanghai. This is trouble. Keeps digging himself in a mental hole. Don’t know if he’s going to get out this time. Really needed a good run in Shanghai to get momentum in the indoor season. Hmm, more questions gonna be asked of Roger now. Roger is so mentally weak these days, 2013 needs to be done with asap. I’ll have to watch the whole match to see what went wrong. Then again, nothing really is going right this year. Also if Wawrinka wins, Fed is getting overtaken in the race. Danger time. Might need to take that wildcard into Vienna after all. Had little chance against Novak. But if he had gotten a win over a top 10 player, it would’ve been just what he needed for self belief. Going to regret saying all this, but too damn bitter right now. I thought the same thing too Ganesh but now that I’ve reflected on the loss, I’m not as sour. Roger indoors changes things a little. Not a whole much because as Jonathan said, zero confidence but playing indoors is a mental advantage for him at least. I think we should lay off the judgement a bit. 2013 was never going to live up to the standards of 2012 and it’s playing in Roger’s mind as he keeps on playing on this year and loses the big points. I think Roger is so frustrated and so motivated to get back to his game, he’s trying too hard. The amount of points he rushed in the last two matches was immense. Roger is fighting himself on the court. 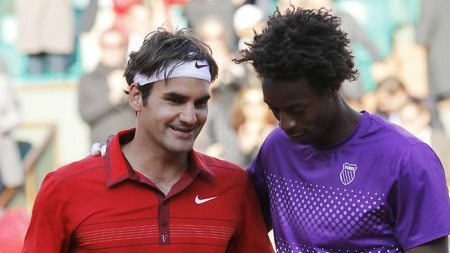 Whilst Monfils played well, it was more a combination of Roger losing the match than the opponent winning it. Seen too much of that this year. Roger has a chance against anyone indoors. It’s just a matter of whether he can press the reset button and forget about 2013. I’m telling you, if Roger makes a run in Basel, he has momentum. Once he has momentum, that is when you know he’s turned it around. Guess I’ll be cheering for Wawrinka tomorrow. Perhaps Del Potro day after and Djokovic on Sunday. Annus horribilis. Makes no sense to fall from grace so dramatically since winning 12 points in a row to go 3-0 up v Djok in the Barclays ATP WTF final last year on 12th November. Not one positive result since then, (and I’m not having Haas @Halle). Have been begging him to get to WTF so I get to see him but at this point I’ve lost the will to continue willing. If he ain’t there, it’s because somebody deserves it more and with Murray out of the equasion, he only needed to avoid being 10th or worse to make it. If he does qualify, only Lazurus could have those woeful results across the whole of 2013 then win @ the o2. Haha yeah I can’t see him winning WTF but guess you never know. having watched fed go down to monfils, i can only say wtf? he seems so indecisive on key points, listless when he is down, and inconsistent. so, if this continues, no matter how hard he practices off-season, how the hell will he gain confidence? i need some uplifting analysis from my fellow fed-fans, cos i can’t think of any right now!! my worry is he will play vienna, get blown away and the same hell returns. The main issue for him right now is confidence and the fact that he has none at all. Like you say it´s so clear on the big points, he looks confused and his shot selection then turnes out horrible at times. But still sometimes the magig shines through and it shows that the magic is still there it´s just a matter of getting it to stay out there, and that comes with the confidence. The thing that settles me is when I think of the Nadal match in Cincinatti, that showed that the game is defintley there with the right mindset. But how does he get the confidence back? Confidence is a tricky size it can come and go so quickly, I´m actually in a slumb my self right now. After a great outdoor season with playing some of my best tennis ever and been a part of the team that qualified my club to second best league in Denmark for the first time I took a three week break because I had some minor injuries that had nacked me the last part of the outdoor season and thaught it was a good time before the swith from clay to hardcourt (outdoor to indoor). And after the three weeks, even though before the break I was at the highest confidence level ever, I was now struggling with the timing and my forehand was gone, and still is. But slowly by every little victory I get in practise the confidence grows. So for Roger the confidence can come partly by good hard training but mostly by victories on tour. So Roger needs to start winning no matter if it´s the most ugly way, he needs to feel the sweet taste of victory because that is the best medicine to the disease that is in his mind right now. So Vienna could be a great opputunity to get some victories, but also an oppurtunity even more damaged confidence, but for me that´s a chance he got to take and at some point it will come back to him and the sooner the better! With all the talk of what he needs to change in his game I keep thinking back to Cincinatti too. That first set was just about perfect, he couldn’t have played it better. So, yes, I too think it’s all down to confidence and what exactly do you do about that. It must be getting worse with every loss. There must be such uncertainty in his mind every time he steps onto the court now, now matter what he says. I’m beginning to think he could benefit more than anything from the advice of a sports psychologist. But I have a feeling he would not accept the need for that, even if he’s thought of it or it’s been suggested. He does like to go his own way. And maybe we should just trust him – he’s done it before after all. With all the negative articles I’ve read about Roger recently, and even some ex-players saying he’s more or less finished, it was nice to see Rod Laver coming out today and saying he’s the best player of his generation, is nowhere near finished and can win another slam. He’s a man that knows something about tennis. Wonder if he will play Vienna? Not sure. Sports psychologist – I can’t see it really. That and he has to figure out his USP. a) Is it going to be all out attack? High risk, high reward. b) Is it going to be defensive? Low risk low reward. c) Is it going to be controlled aggression? Low risk, high reward. Right now his game is in the middle of nowhere. He can’t out hit his opponents and he sure as hell can’t outlast them at the moment. He has to choose one and play like his life depends on it. He’s playing high risk, low reward tennis right now. The worst possible combo. How can it be that a Nadal who plays low risk tennis is converting it into high rewards? It’s controlled aggression. I defintley agree that his returns is an area in his game that he has falling behind fthe other top guys the last seasons. And for that I was so happe when he startet testing a bigger racquet because that could help him in that area. But that being said he stil gives himself plenty of oppurtunities to break the opponent despite his more weak returns. Right now it´s the mental issue of converting those chances he gets that´s the issue, in fact all the big points are the issue! What happend to the times when he was facing a breakpoint you could at least expect a great first serve to make the opponent find the answers? And mostly he would hit a ace, those time are also gone. I remember in 2007 at us open where he called his serve his cliffhanger, good times! Now on big points it´s cliffdiving instead. But the solution is there to all his troubles I just don´t know what it is but I know that Roger will figure it out like he always does, I just hope he figures it out soon before the new season is coming up. I think standing behind the baseline is near suicide for Roger on the return. Gives the opponent an advantage. Watch some Sampras returns, gotta take that strategy. The answer is to hold more easily via his own first serve and take biggers risks on the return. This is true. Fed can’t return like Novak and Djokovic way behind the baseline, gonna get aced. The further he stands away from the baseline, especially with the courts these days, the higher the ball gets especially to the backhand side where players like to hit it. Fed needs to take the ball early to be aggressive. And the only way he improves on the return is run around the backhand and have smooth service games. Oh cheerleaders! Is there anything left for me to say?! I think the previous comment from Mark kind of sums it up: “But the solution is there to all his troubles I just don´t know what it is but I know that Roger will figure it out like he always does”. Yeah sure, Roger the ageless wonder, the immortal one – he can probably walk on water too! We all grow old, cheerleaders. It’s time for you all to grow UP and stop being such crybabies, wishing and hoping and dreaming of the impossible. Not even Roger can turn time back! You should thank your lucky stars that Murray has chosen this time to go for surgery. Othewise it would have been – and still could be – bye, bye Barclays! Remember, Jonathan, when you said that was unthinkable – perhaps it’s time for you to “retire” your predictions! Hah! Could somebody please block this idiot? I mean, why would you come to a Fed site and be a little b**** here? Just shows off the inferiority complex that you have. MarkWandy, and others, please don’t address this low lifer called Arif. He has been trolling for quite some time now and usually shows up right after Roger loses a match. And the same with a guy named Pablo. Don’t feed him. Please delete any comment that you may have written as a reply. There are a ton of douche bags who lurk on these kind of blogs. Just like the world has learned to live with retarded terrorists, we need to learn to live with this douche.